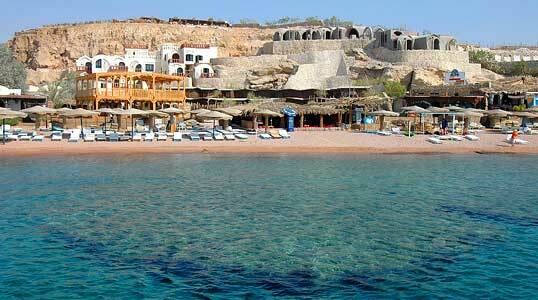 Sharm el Sheikh is situated at the most southerly point of the Sinai Peninsula. 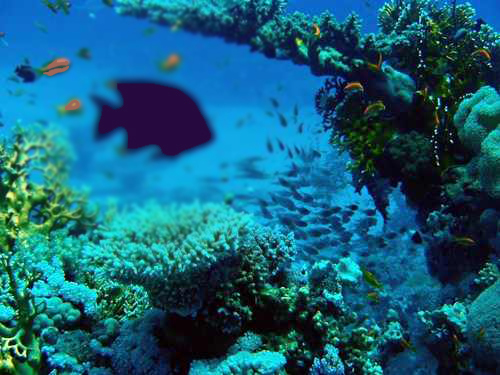 It is absolutely the best dive destination in Egypt for daily diving, having the most variety of dives, and boasting the famous Ras Mohamed National Park and Strait of Tiran. With pristine coral reefs close to the shore, clear waters, and a rare variety of superb marine life, Sharm el Sheikh offers ideal conditions for beginners, intermediate divers, and underwater photography, as well as advanced to professional divers. 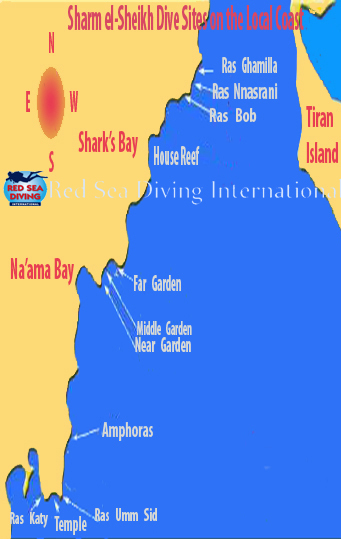 There are more than 40 dive sites in Sharm el Sheikh to select from, with many accessible as a shore dive. 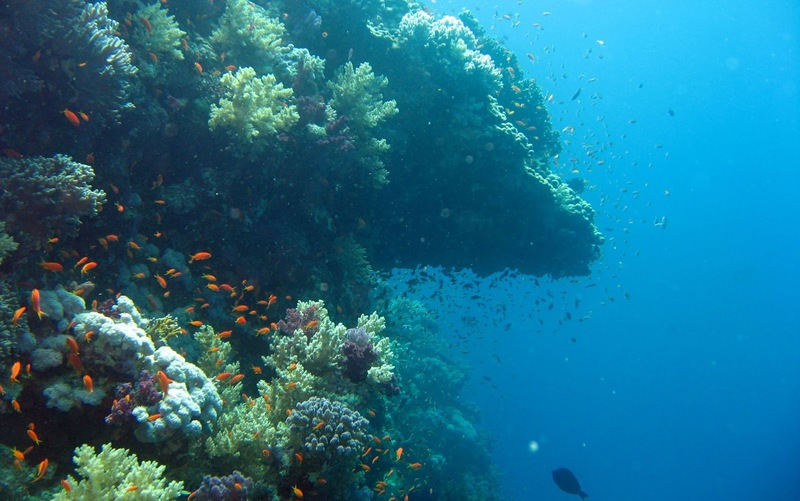 The coastal waters around Sharm el Sheikh is the most protected diving location in Egypt, having been granted Marine Park status with 'no fishing' laws. 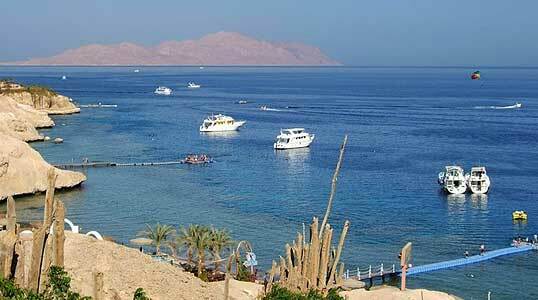 Sharm el Sheikh is flourishing as one of the world's finest scuba diving destinations. 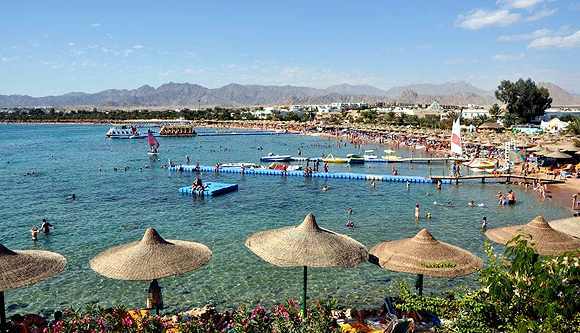 Directly in front of the Marina for Tiran on the beach is a pristine reef, centrally located in the midst of all the best diving sites of the local coast. The house reef is unspoiled with superb corals, an underwater nursery that is a paradise for photography, perfect for Night Diving and suitable for Open Water Courses, Introductory Dives, and any beginner level dives. There are conveniently 4 - 5 Bedouin Restaurants serving home-made Oriental and Italian food, and the best red snapper of the world, caught fresh from the Bedouin fishing village in el-Tur, Sinai. 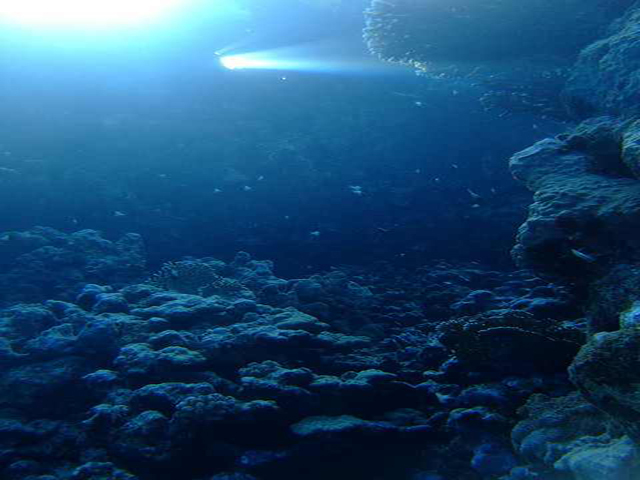 A great drift dive with excellent hard coral formations due to the currents. Ras Ghamilla is abundant with small fish and many types of pelagic species. In the right season with a little bit of luck it is possible to see Manta Rays or even a Whale Shark. This dive site has spectacular changing scenery that can be done as a drift dive or mooring-line dive. Ras Nasrani is abundant with table corals, gorgonian fans, and anemones, (including some beautiful red anemones). The marine life includes giant Moray Eels, and many reef fish, along with pelagics such as Barracuda, Jackfish, and Tuna, truly a photographer's paradise. 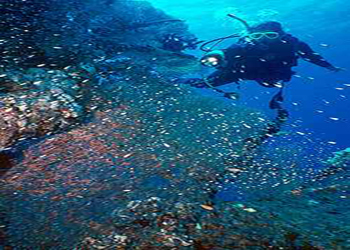 This dive site is a mooring-line dive, and known for its calm conditions, being sheltered from current and wind. Ras Bob is situated along the only section of coastline where no hotels have been built, belonging to an exclusive residential area with a private beach. 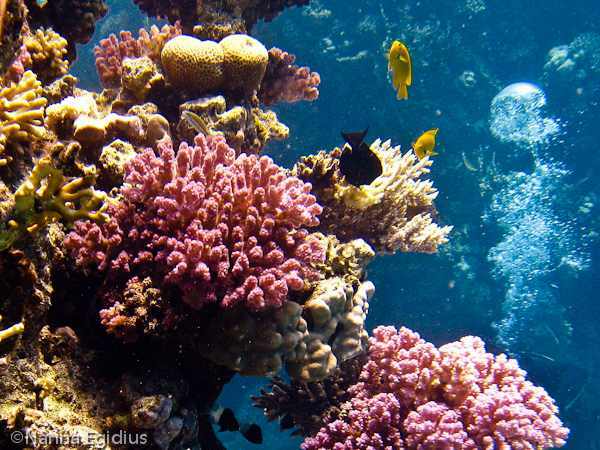 The corals are in pristine condition flourishing with reef fish. The reef wall has a lot of overhangs, some small caves, and rows of very large pinnacles where you can find plenty of Morays and Scorpion Fish hiding inside. This is one of the few drift dives on the local coast of Sharm el Sheikh, starting with a coral garden in the first part of the dive, and changing to a very nice wall in the second part of the dive. The coral garden is on a gently sloping plateau with several pinnacles and small caves filled with glass fish, which are surrounded by large and small coral heads scattered in between. The plateau gradually turns into a massive wall with an overhang that drop offs vertically at 25 meters. The wall on Far Garden has 2 resident Eagle Rays and 2 resident Turtles that are frequently spotted. This site lies in the middle of a large sheltered bay in front of the Hyatt Regency, with Far Garden at the north corner and Near Garden at the south corner of the bay. Middle Garden has several different mooring-line dives, making it one of the best diving sites to start your dive package. The entire bay has a sandy bottom scattered with coral heads and boulders of all different size, shapes, and colors. There are also a few pinnacles filled with glass fish. The marine life to find inside the corals, large or small, is endless: Nudibranchs, Hawkfish, Damsels, Anemone Fish, Groupers, Octopus, Moray Eels, Blue Spotted Rays, Napoleons, and just follow the schooling Goat Fish to find Gray Eels. This site is by far the most colorful of all 3 Garden sites, with untouched corals because there is no hotel on the headland. Near Garden can be done as a mooring-line dive, but it is much better to do a drift dive, even though there is rarely strong current. The dive starts on a sandy plateau inside the bay, and as you work your way out around the headland, there is a chain of pinnacles along a plateau that is completely covered with coral heads and soft corals. This reef contains the most abundant reef fish imaginable to find at a single dive site. Dive into a club or a pub, make some shopping, or have dinner at many restaurants that offer world class dining. This site is directly in front of the Ritz Carlton, situated on a segment of the local coast that is not sheltered. The current can be quite strong and suddenly change direction in the middle of the dive, or you can start the dive with absolutely no current, and end the dive with a very strong current. Amphoras has the remains of a 17th century Turkish vessel transporting amphoras filled with mercury. There are some very large amphora's scattered around the northern part of the dive site, and the original anchor of the vessel with inscriptions can be found in around 30 meters. This dive site is not highly visited because few guides can find the amphora's and ship's anchor. But even without the amphora's, it is a wonderful dive site, which seems to be a well kept secret. Right at the shore line is a mini vertical wall dropping to 10 meters, covered in hard and soft corals, and filled with dozens of small caves. There is one spot in particular where a family of Scorpion Fish lives and breeds. From the mini-wall in 10 meters, the plateau slopes out gently to about 25 meters where there is a vertical drop off having no bottom in sight. The plateau has 4 large pinnacles filled with glass fish in about 18 meters, which are spaced out along the dive from beginning to end. If you venture out to the edge of the plateau and dive along the drop off, it is common to spot black-tip reef sharks. This site is a favorite of Jacques Cousteau, situated at the north corner of el-Fanar Bay, (lighthouse in Arabic), having a lighthouse on the head-land which officially marks the beginning of the Strait of Tiran. Ras Umm Sid is best when done as a semi-drift dive, as this dive has a 90 degree turn at the corner of the coast line, and often very strong current at the corner. The dive starts from a mooring line with a massive pore coral on a sandy plateau going down to 25 meters. The sandy plateau is filled with numerous coral pinnacles teeming with marine life that stretch up 25 meters from the bottom. 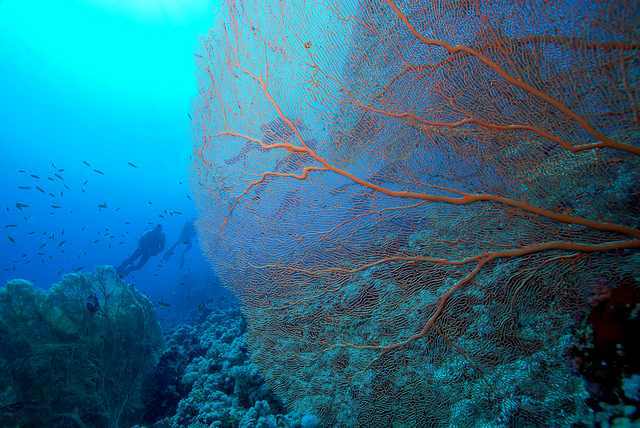 As you approach the corner, the plateau gradually turns into a wall with a large gorgonian forest at 17 meters that drops down to depths further than the eye can see. The gorgonian forest is filled with caves full of glass fish and lion fish. Because of the strong currents and open sea at the corner, plankton is trapped here attracting plankton feeders, game fish, and predators. 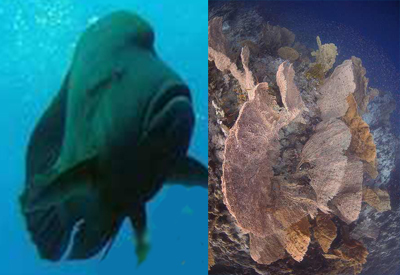 There is a resident Napoleon Fish who has grown quite large over the years, and a school of Barracuda that hover in the blue facing the current at the corner. You never know what surprise awaits at the corner in the current, so keep your eyes peeled to the blue by the corner. After changing direction past the corner, the topography changes to a plateau sloping out to a drop off at 25 meters. The plateau is completely covered by hard and soft corals, pinnacles, and alive with white and pink Alcyonarian's that flash open and closed in the sunlight, which is very enchanting. 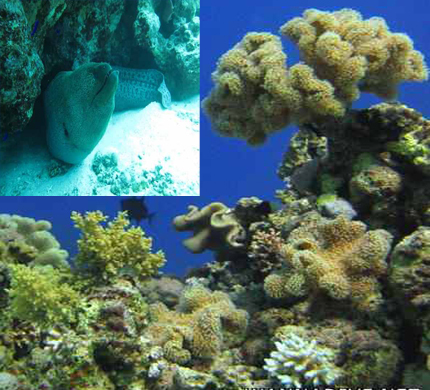 This plateau is covered with Moray Eels, Grey Eels, Scorpion Fish, and Stone Fish hiding in the coral heads. 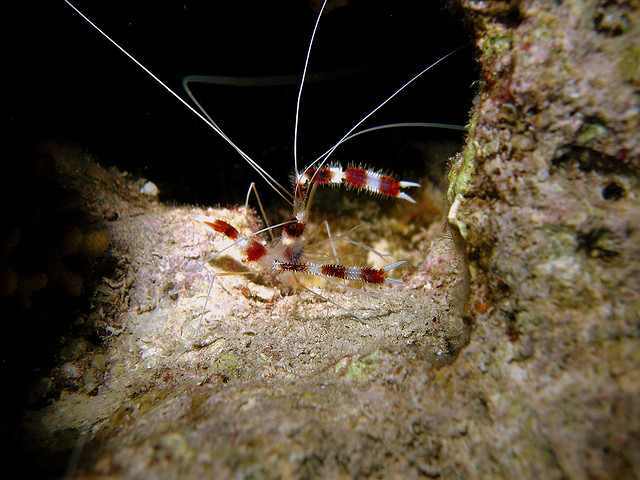 Ras Umm Sid is different every time you dive it, and truly a World Class diving site! This site lies in the middle of el-Fanar Bay (lighthouse in Arabic), which is a massive sandy plateau with depths from 6-30 meters. There are 3 coral pinnacles shaped like the columns of an ancient temple that give this dive site its name. Temple is the most popular dive site of Sharm el Sheikh, because calm, clear waters and the lack of current are guaranteed in any weather conditions. The coral pillars are full of Parrot Fish, Lion Fish, Bat Fish, and Butterfly Fish, and the resident Napoleon from nearby Ras Um Sid often passes by this area. At 30 meters along the edge of the bay is a beautiful gorgonian with glassfish. This site is known for being the ideal location for training and introduction dives, having shallow depths between 5 - 20 meters, with several coral pinnacles and table corals a few meters from each other, and plenty of sand in between. The coral pinnacles at Ras Katy are covered with Alcyonarian's and Broccoli Coral, inhabited by Butterfly Fish, Banner Fish, Lion Fish, Anthias Fish, and Fusiliers. The reef walls of the pinnacles have small caves and crevices, where Shrimp, Lobster, Spanish Dancers, and Octopus can be found at night, making the best night dive in Sharm el Sheikh.